Bahrain is an archipelago of thirty-three islands in the Persian Gulf in the Middle East. It is located off the coast of Saudi Arabia and Qatar. Bahrain might not have been a very popular tourist destination in the past, but things are slowly changing. People are visiting Bahrain to see the ruins of the Dilmun civilizations, the famous scuba diving spots and the little desert towns and local culture. Here’s a list of some of the places to visit on your next visit to Bahrain. Manama is the capital city of Bahrain. It has a thriving nightlife, with clubs and bars popular with visitors from all over the world. Manama may seem like any other metropolitan city but it offers much more than the hustle and bustle of the city life. The Arabic souks are the soul of Manama. The souks here are famous for spices, perfumes and carpets. Not everyone likes fast cars or race tracks, but the Bahrain International Circuit (BIC) has to be one of your priorities on your visit to Bahrain. It is a once in a lifetime experience to watch a grand prix at the BIC. The BIC is also open to track days which lets people drive on the racing track at insane speeds. So if you’re a speed-freak, the BIC is the place to be at. 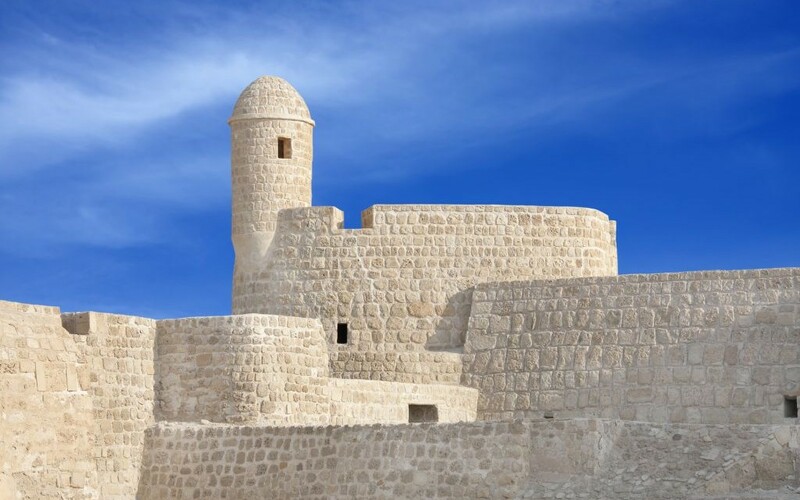 The Qal’at al-Bahrain or more simply known as the Bahrain Fort is the country’s only UNESCO World Heritage site. The fort is rich in archaeological heritage and one of the best places to experience the sunset in Bahrain. The fort also hosts activities and events on special holidays and occasions which are surely to mesmerize you in every way. The Ahmed Al-Fateh Mosque is also known as the Grand Mosque. It is one of the largest mosques in the world, encompassing 6,500 square meters and having the capacity to accommodate over 7,000 worshippers at a time. It’s simple, yet elegant. The mosque has no entrance fee and is much more than just a place of worship. Al Zallaq is a village on the western coast of Bahrain. Here you’ll find turquoise lagoons and date palms along the shore. Zallaq is popular for its white sand beaches that offer water sports like jet-skiing and kite surfing. So if you just want to relax near the sea, Zallaq is the place to be! There’s this and so much more that Bahrain offers. From being rich in culture and heritage to a happening night life and beautiful beaches, Bahrain is slowly becoming the holiday destination to visit among the Arab countries. If you’re wondering how to book your visa to Bahrain or want details about a Bahrain Visit Visa, then head over to www.visalounge.com and we’ll help you solve all your doubts.